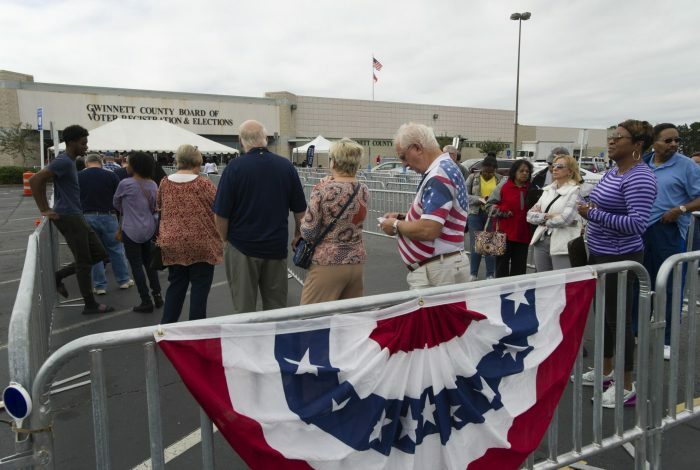 When WhoWhatWhy reporters Timothy Pratt and Jordan Wilkie interviewed people standing in line in Cobb County, GA, this week, they realized that their work was the reason why some of the voters were braving long wait times to cast an early vote in person. These Georgians had read our exclusive story on the high rejection rates of absentee ballots — particular those from people of color — in some counties, and wanted to play it safe by showing up to cast their vote. Unfortunately, the assurance of having their vote counted is relative, because Georgia uses outdated and vulnerable voting machines with no paper trail. And, as WhoWhatWhy has shown, some of these machines were sitting unsupervised in an unlocked room, which does not inspire confidence in the security of the midterms. So it seems as if voters in the Peach State — at least those whose registrations were not purged by the “Exact Match” program that Secretary of State Brian Kemp implemented, or were sitting in his office unprocessed — have no truly good options to vote. People in many other states face similar challenges. Because every person who ends up not voting is a small victory for the vote suppressors. WhoWhatWhy’s reporting in Georgia and elsewhere, not just in the past weeks but over the years, leaves no doubt that state legislators and secretaries of state like Kemp or Kansas’s Kris Kobach, both of whom are running for governor in their respective states this year, are actively and intentionally undermining US democracy. They don’t want everybody to vote because they know that will hurt their chances and those of their party. But sitting elections out because the obstacles are too numerous or seem too high means that the schemes to hijack democracy worked. Every person who shows up to cast a ballot for candidates who support fair elections makes it more difficult for candidates who don’t. It’s a vote for democracy. It’s a vote for volunteers like Beatrice Williams, whose story WhoWhatWhy video producer and editor Kate Walker told this week. It’s a vote for advocates like the ones working for the Lawyers’ Committee for Civil Rights Under Law, the group which was just profiled by WhoWhatWhy podcaster Jeff Schechtman. And it’s a vote for the untold millions of Americans who were never even given the opportunity to participate in an election because of the color of their skin or their gender. So we hope that people across the country will defy those who put hurdles in their way. We hope they will not be discouraged by long lines. We hope they will help others who may have trouble getting to vote because the polling places in their neighborhood were closed. We hope they will organize carpools and recruit babysitters so more people can vote. We hope they remember that they have the right to request a provisional ballot if they are turned away for any reason. We hope that they will make their voices heard and that the US can take a step toward becoming a more inclusive democracy. And we will keep doing our part to shine a light on all those who are standing in the way of making that happen.